house for the DCI World Championships and Major Events, a first-class subscription to DCI Today and other cool stuff, and your contribution helps to support Drum Corps International and the corps who participate in the Summer Music Games Tour. 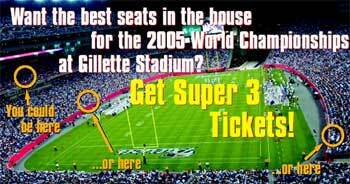 To say thank you to loyal Super 3 ticket buyers and other drum corps fans attending the 2004 Denver World Championships you get early access to 2005 World Championship Quarterfinals, Semifinals and Finals Super 3 tickets before the rest of the world! Pick your seats on the spot! Can't be in Denver? You can still order your 2005 World Championship Tickets. Order early for the best selection. Super 3 ticket package offer expires Aug. 20, 2004. Single night tickets go on sale beginning Wednesday, Sept. 8, 2004 at 9 a.m. Central time. Super 3 Package Tickets are available for quarterfinals, semifinals and finals performances at Gillette Stadium. Quarterfinals and Semifinals events will be performed to the visitor side of Gillette Stadium. Location and views will be comparable to the World Championship Finals seating on the home side.